The year was 2006. Booker T had been in a bit of a stagnant period in his career and although he had his wife Sharmell by his side, he was still struggling to find his way. In previous moments, there was a feud with Kurt Angle that featured a promo referencing beastality, Booker taking on Heindereich, before turning heel again and feuding with Chris Benoit and The Boogeyman (which was hilarious to be fair). What bothered me about Booker having his talent so wasted was that he was still more entertaining than just about everyone else on the roster. Something had to give. Something. Enter the King of the Ring Tournament. The tournament was resurrected years after the last PPV occurred, and with it, we saw a new side of Booker. The finals of the tournament seemed prone to be all about Lashley winning and getting a good push. That was not the case and thankfully we got Booker getting the win in the Tournament Final at Judgment Day 2006 and instantly, we saw a royal disposition grow from Booker. It was undoubtedly hilarious from the start, as Booker seemed so proud to win the crown and bestowed with such a regal honor. The levels of where Booker took it however was absolutely brilliant and likely the greatest period of his career from a character standpoint. 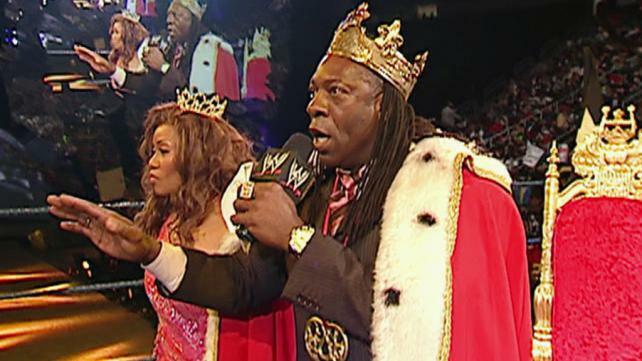 Starting with King Booker's Court, he assembled a team with Sharmell as his queen, Fit Finlay (Sir Finlay), and William Regal (Sir Regal). 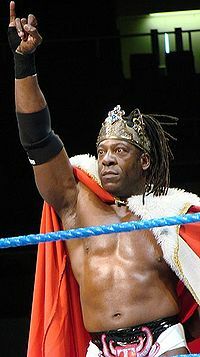 Booker believed he was indeed a Royal monarch in the wrestling world, and as such, he created mannerisms and began wearing the stereotypical attire that fit for British kings. It was over the top and comical, bordering on ridiculous, but what made it work even more was the atrocious English accent that he tried to use. Booker would use a whole different vocabulary along with it, taking us back to a time where most kings dined with no eating utensils. That was only the start of it, as Booker would go a step further and become almost obsessed with making Lashley kiss his royal feet. Booker and Lashley had a solid feud, but it ended sort of abruptly, as Booker would go on to bigger and better things. Those bigger and better things would be the World Heavyweight Championship. After defeating Rey Mysterio for the title at the Great American Bash, Booker took the gimmick to another level with his championship celebration, proclaiming himself as the King of The World. It was after this brief win over Rey that he would be trapped in bad booking as champion. Booker was a transitional champion, but he made the most of it anyways. He would be painted as a royal coward, hiding behind his court, using Finlay and Regal to help him win matches and dressing down his own allies in angry promos when things didn't go his way. It was obvious this was a temporary character change for Booker and while I wanted him to get more TV time and defend the title a little more seriously, he had a decent 4 month reign that really only consisted of him feuding with Batista. Backstage rumors not withstanding, Booker would lose most of his battles with Batista, as he lost to Batista via DQ at Summerslam, before dropping the title finally to him at Survivor Series, but not before losing the rest of his court with an unprovoked attack on Regal. Finlay and Booker still teamed after this and after the title loss, as John Cena and Batista would team up to defeat the two. It was insignificant for the most part, and though Booker's booking wasn't the best, promo wise, he would keep me laughing and entertained. 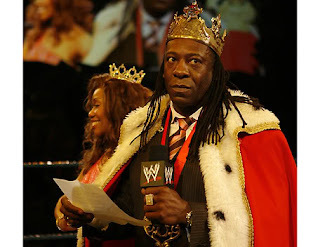 The story of King Booker isn't rooted in the booking, but rather his hilarious commentary and promos. 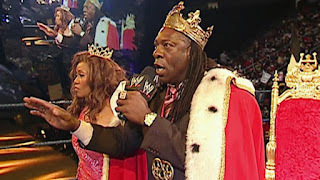 As 2007 began, Booker struggled and would be off TV for a few months due to injury until he got drafted to RAW and began a small feud with Triple H. This is the last highlight of Booker and his in ring career as King Booker, as in the weeks leading up to his Summerslam match with a returning Triple H, he berated Jerry Lawler and called him "Jerome", which still makes me laugh. Unfortunately, the promos and work he put in were all for nothing, as he would be easily defeated by Triple H and soon drift off TV following a Wellness Suspension that he claims was wrongful. Booker asked for his release soon after and was granted it. It was the worst way for the story to end, but I guess Booker was tired of being wasted. 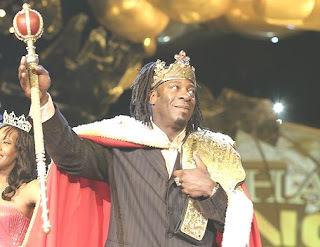 He walked away from the WWE at that point, but he left his mark with King Booker and that is the best time in his career from a character point. Long Live King Booker!